I've been meaning to post about this for a while but have just been so swamped I haven't gotten around to it. I've still got two weeks of pics in the camera I need to upload! A few months back, Care2, a really cool social activist organization asked me if I'd like to submit pieces for them in the form of a blog. Never the kind to realize that I already had too much on my plate, I of course agreed. You can check out the pieces I've written so far here but I'd also urge you to check out and sign up for their action alerts. They send you info on bills that are coming up and pressing issues and let you know how to have your voice heard on the subject. NPR's Day to Day came to the house a few weeks back to do a follow up from the first interview they did in January. It aired on Thursday and is a really nice piece along with video on the website as well. Highlights are definitely hearing the missus on national radio saying she's still glad she married me (I'm sure I'll be paying for that for a while) and hearing the dog drinking copious amounts of water in the background of the video. 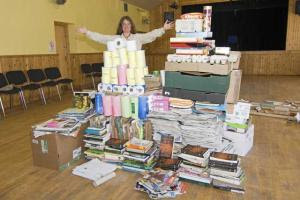 Mrs. G over in merry old England sent a link to this unbelievable article from the The Independent about Mandy Haggith who put together a pile of a years worth of paper (1/4 ton per person) for her local townspeople to see. It's really great because as a result, they have started recycling/ reducing and re-using like crazy. Just goes to show that with knowledge, things change. The article is a must read though more for the description she gives of deforestation seen first hand as a result of our thirst for paper products. In researching a book she wrote entitled Paper Trails she traveled the planet and saw first hand the devastation brought about by paper companies. I'm putting it on my reading list for sure. Below are some practical tips and facts to help save paper. * Deforestation caused by paper production is thought to be a bigger cause of global warming than transport. * Each person in the UK gets through 250kg of paper a year. The worst offenders are the Finns at 333kg. The average Somalian uses 20g. * Much of the UK's paper is barely used and a large proportion ends up in landfill. Just 42 percent is recycled – but as there are so few recycling mills in the country, most of this ends up being sent abroad. * It is a myth that most paper comes from sustainable sources. Seventy percent of it comes from natural forests. * The UK produces virtually none of its own pulp and imports 80 percent of its pulp. * Around 75 percent of the paper for magazines is production wastage and is never read. * Advertisers know that 99.7 percent of recipients of junk mail throw it away unread. They think it's worth it for the 0.3 percent who might. 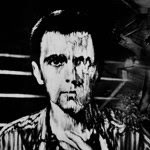 I have been a HUGE fan of Peter Gabriel for quite some time and he has always impressed me with his world views and campaigns towards social consciousness. A friend sent me this from his website today and I thought it was worth sharing. We're happy to report that Peter and Meabh are proud parents of a second son. Luc was born on Saturday 5th July, a bouncing 7lbs 2 oz. Big brother Isaac reports that mother, father and baby brother are all doing well, and requests that any congratulatory flowers people may contemplate sending be left to grow in the ground for all to enjoy. What a great way to welcome a child into the world by asking people not to consume and leave nature as it is. Very cool. As a friend of mine who read this joked "I'm going to go out right now and not send gifts to a lot of people". Granted, my guess is that PG doesn't need much but for those of us who don't, what a great idea. When my wife and I got married a few years back, we actually asked guests to donate to a few selected charities in lieu of gifts, or one of their own if they preferred. Those that truly wanted to give something special did, but most donated in our honor and raised a lot of money for some good causes. It was easier on them (not too much back and forth about a gift) and we enjoyed knowing that our occasion helped others. 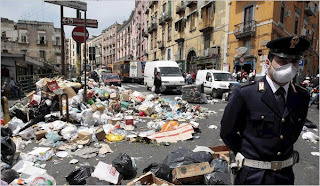 Earlier in the year I posted about the garbage problems in Naples Italy. Well, it hasn't let up, and now, the city of Hamburg, Germany will be taking all of the garbage that has been collecting in the streets of the city for the past several months. For 11 weeks, a 56 car train will carry 700 tons of garbage a day 44 hours away to it's final resting place. It's pretty insane isn't it? Yet it's not a singular problem, or at least may not be in the near future. Here in the US we are lucky enough to have lots of space to dig holes and fill them with trash. But in Europe, the problem is growing so rapidly, that the EU is saying that by 2020 all members must cut their refuse to 35% of what it was in 1995. Shocking but obviously necessary. While many countries are going to have some big problems changing their ways, Hamburg is way ahead. As this article in the Times explains, on the streets of the city, pedestrians are required to separate their trash into four different bins depending on the nature of the refuse. 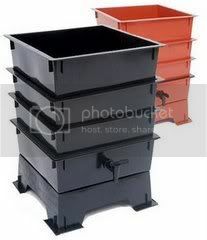 What needs to be disposed of as opposed to recycled ends up in highly efficient incinerators which generate electricity and trap noxious fumes from entering the environment. Hardly the kind of thing you want going on next to your house, but then again, you don't want to live next to a landfill either. The first step to any solution is recognizing you have a problem. Perhaps this is the beginning of the beginning. 1 broken plastic ring from light? 1 broken plastic ring from light - recycle?